Last night, 20+ people attended the Langley City council meeting. At the beginning of the council meeting, a Committee of the Whole was held to allow people to provide their feedback on the proposed 2017-22 Financial Plan. Four people spoke. People at last night's council meeting. Select image to enlarge. The first speaker said that the City did not advertised the financial plan, or about opportunities for public input. He stated that he only saw one newspaper article. While local government doesn’t control the media, there were three articles in the local papers. One article went live on the Langley Times on January 24, another on the Langley Advance on January 29, and a video about the open house on February 1 on the Langley Advance. January 25 Langley Advance newspaper ad about Langley City Financial Plan public input opportunities. Select image to enlarge. 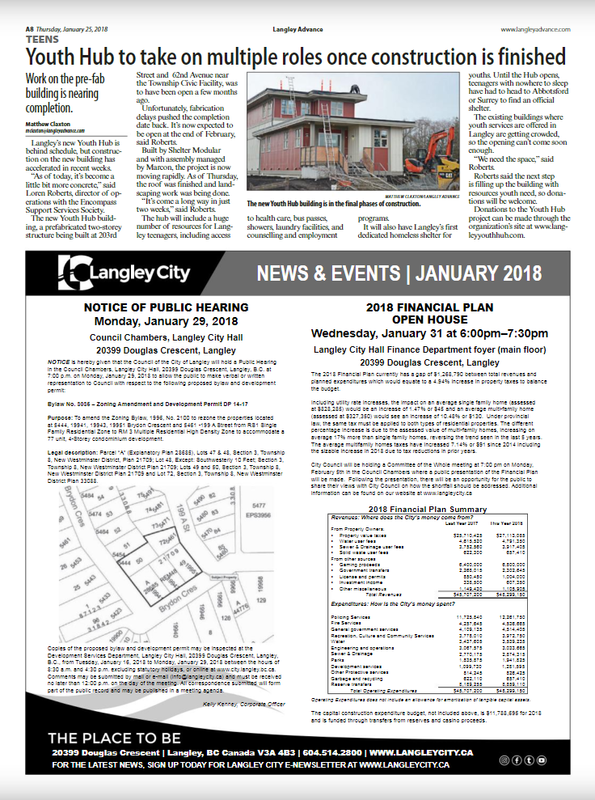 In addition, Langley City advertised in the Thursday, January 25 edition of the Langley Advance, on the City’s website, on Facebook, and on Twitter. Local governments are legally required to engage with the public during the budget process. Another of his concerns was about the increase in RCMP policing costs which account for about 45% of property tax. I’m also concerned about why local government is responsible for policing costs given our minimal control of policing services. The additional three residents that spoke were concerned that fixed-income seniors who have lived in single-family homes long-term, would no longer be able to afford to live in Langley City due to the rapid increase in their home values. If you do own your house; are over the age of 55, a surviving spouse of any age, or a person with disabilities; you can defer your property tax up to 75% of the equity of your home. If you ever sell your home or transfer ownership, the deferred tax becomes due. Given the rise of home values in our region, most long-term residents would be able to defer property taxes for the remainder of their lives, and still have extra equity. The average property tax increase for single-family homes is $45 this year. Other general comments were that council needs to ensure that there is no “fluff” in the budget. Council gave third reading to the proposed 2018-22 Financial Plan. Council will vote on adopting the financial plan at the February 19 council meeting. For more information on the financial plan, please read my previous posts on the operating budget and capital works program. Tomorrow, I will be posting about other items that were covered at the meeting.